Highway signs are supposed to help, but in the District, some signs are having the opposite effect. See the signs around the District that may have drivers — and even pedestrians — scratching their heads. WASHINGTON — Highway signs are supposed to help, but in the District, some signs are having the opposite effect. The District Department of Transportation plans to improve the signage along some of the downtown freeways in the coming months, but until then, drivers will be doing a double-take. With only a few precious seconds to absorb the information presented on a sign, every word counts. See the signs around the District that may have drivers — and even pedestrians — scratching their heads. 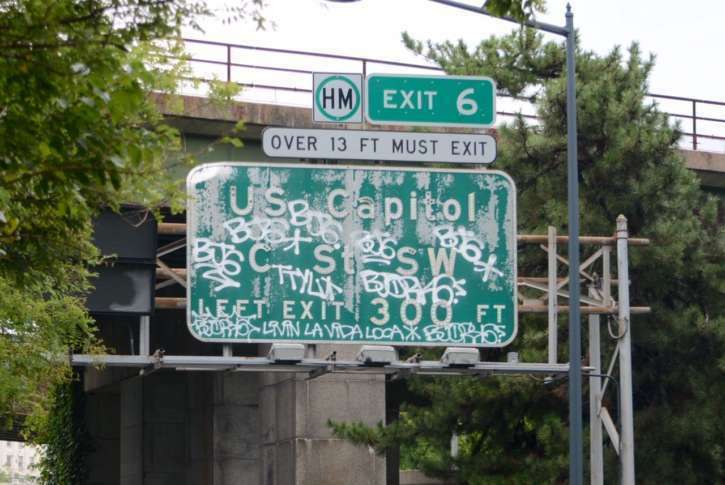 Conveniently located off the Southwest Freeway is Exit 6 toward “USB Capitol BJ6SCT LIVIN LA VIDA LOCA.” The old, graffiti-covered sign has been defaced over many years. It’s one of the few remaining button-copy signs in the region — in other words, it’s been around for a long time.